I am a huge fan of al fresco dining. 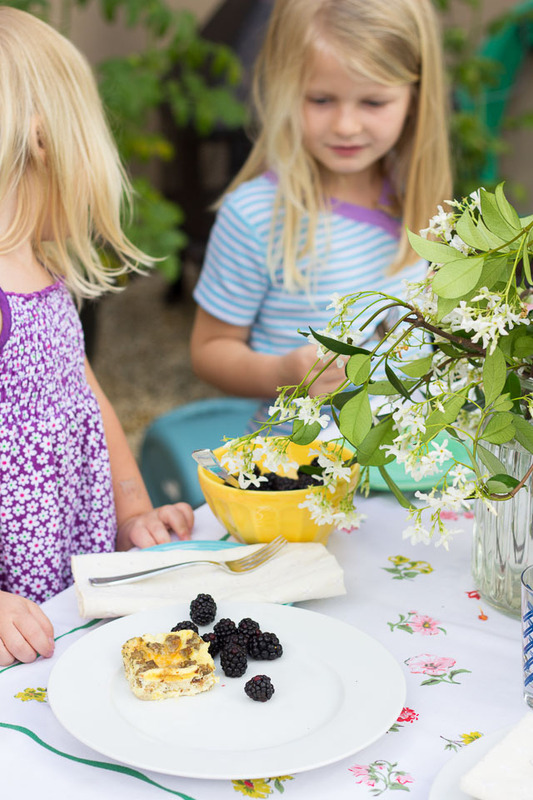 As I tell my girls, “food just tastes better outside.” It’s so true! While my husband loves to grill, my favorite meal to eat outside is actually a leisurely weekend breakfast. Especially here in Texas, the temps can heat up fast and the morning is the perfect time to get outside and enjoy some fresh air before the heat (and mosquitos!) take over. While this breakfast set-up in our backyard picnic table may look fancy, it’s just me playing with some of my thrift store “treasures” and some flowers from our backyard (one of my favorite things to do while my girls are watching their morning TV shows and my husband is sleeping in)! 1. 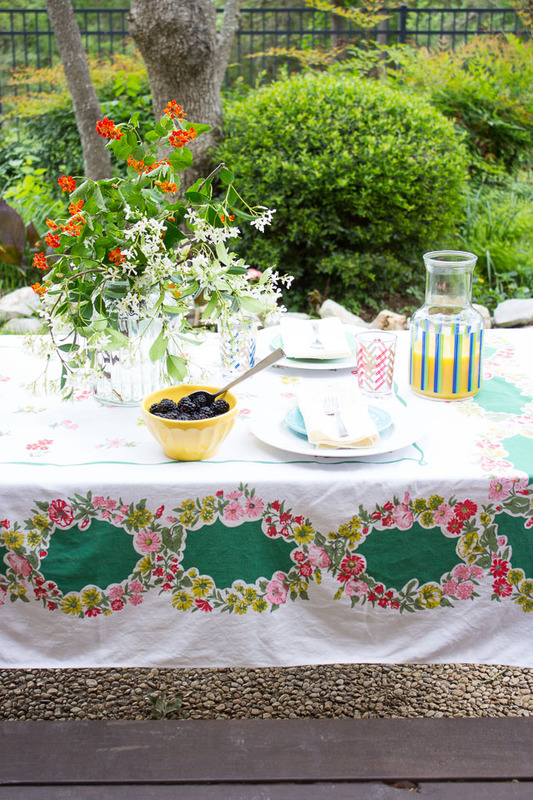 Pretty vintage tablecloth – I have a collection of floral-patterned tablecloths that I’ve picked up at flea markets for $10-$15 a piece over the years. 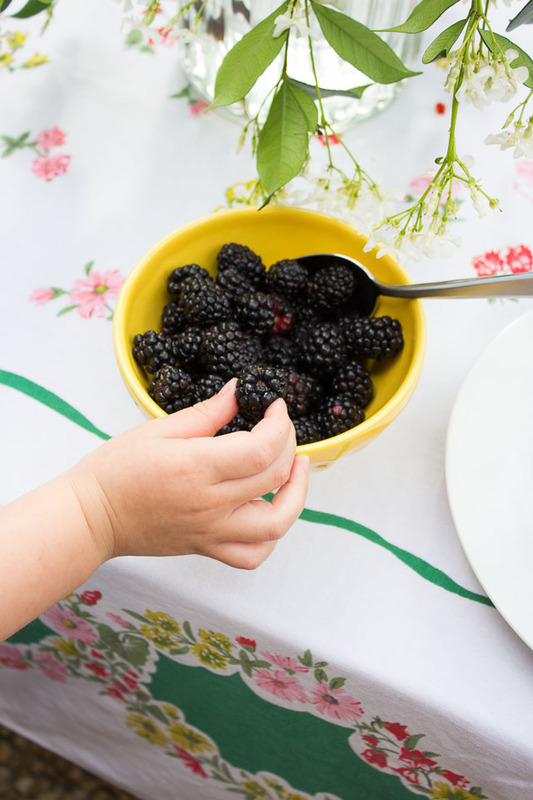 They are perfect for using outdoors – not only do they create a clean surface on the picnic table, they wash up great (the quality of cotton was just so much better back then). My only issue with my tablecloths is that are wrinkly after being folded up and I refuse to iron them! However I found that this Downy Wrinkle Releaser Plus works wonders. I just spread the tablecloth out on the picnic table, give it a spray all over and pull on the edges and the wrinkles completely smoothed out. Pure magic! 2. 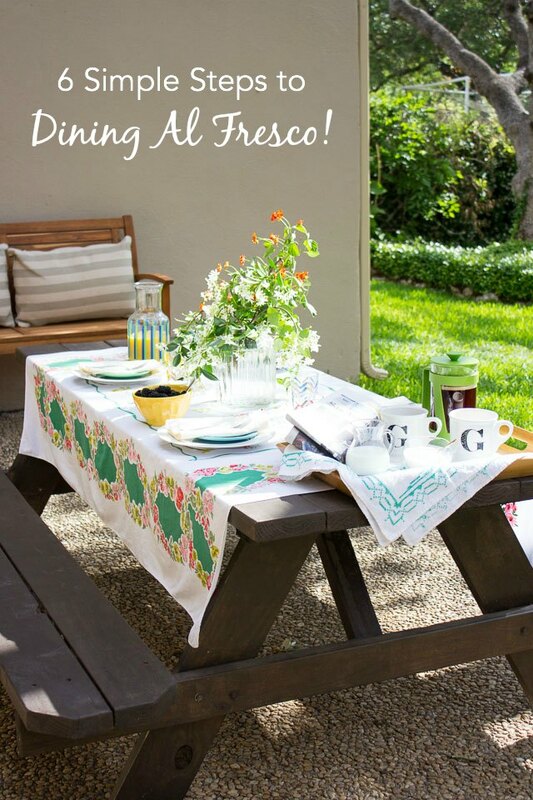 Cloth napkins paired with simple dishes – I also love using cloth napkins outdoors. The main reason – they don’t blow away in the wind! I found these pretty eyelet ones for 50 cents a piece at a garage sale. Melamine dishes are a perfect option for outdoors – they won’t break if you drop them but are heavier (and prettier) than paper plates. 3. 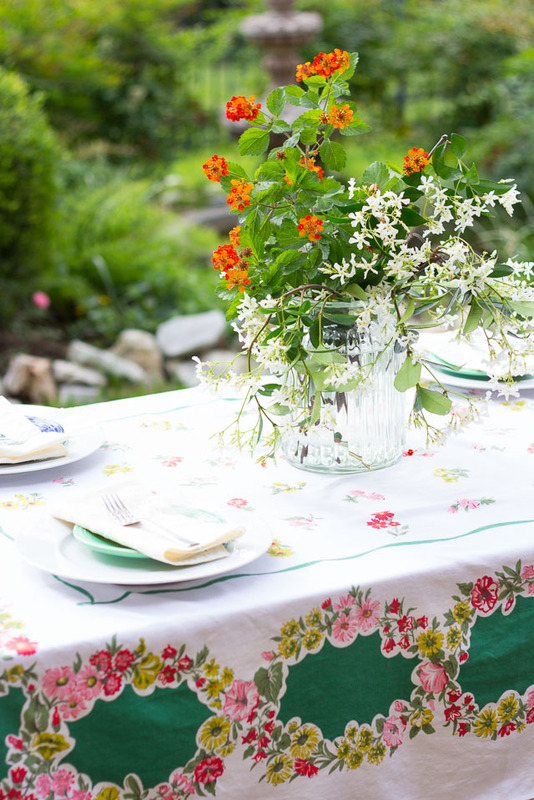 Backyard blooms – this arrangement looks like a million bucks (if I say so myself!) and it is literally just a few cuttings from our jasmine vines and lantana bush in a glass vase from the Goodwill. I think any backyard arrangement can look gorgeous – just find something blooming and pair it with some pretty greenery from a bush, vine, or leafy plant. You can’t go wrong! 4. 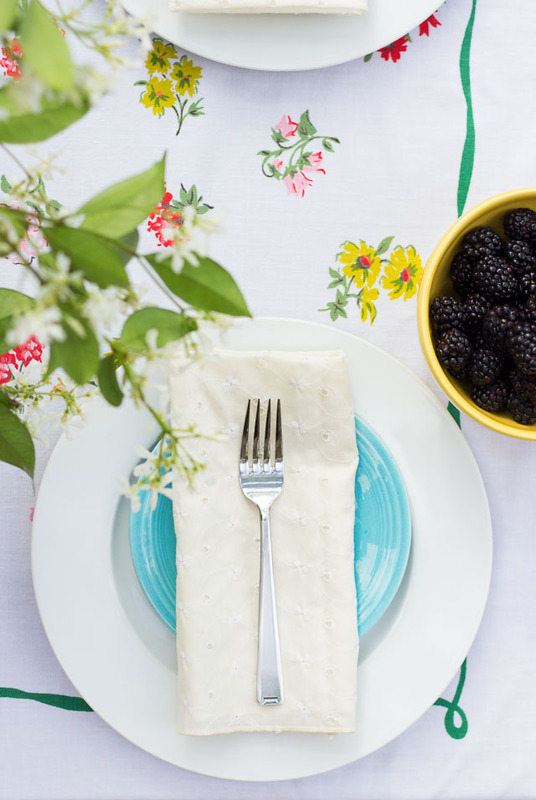 Simple food – I typically have so much fun decorating the table, the food is kind of an afterthought – ha! I like to keep the food simple and portable and usually just make a batch of muffins or an egg casserole with fruit. For this brunch I made individual egg sausage casseroles in a muffin tin. 5. 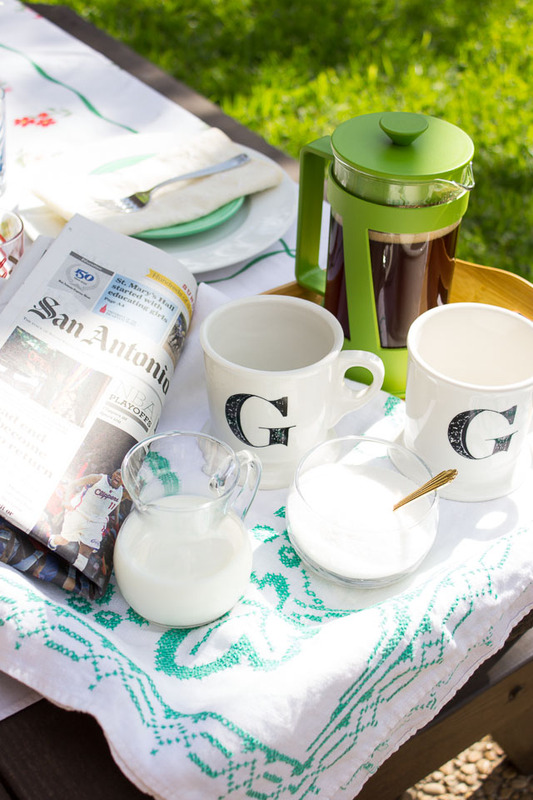 Lots of coffee and a newspaper – this is really the highlight of a weekend breakfast right?! I love using our french press because it is portable and a fun change from the Keurig we use during the week. 6. 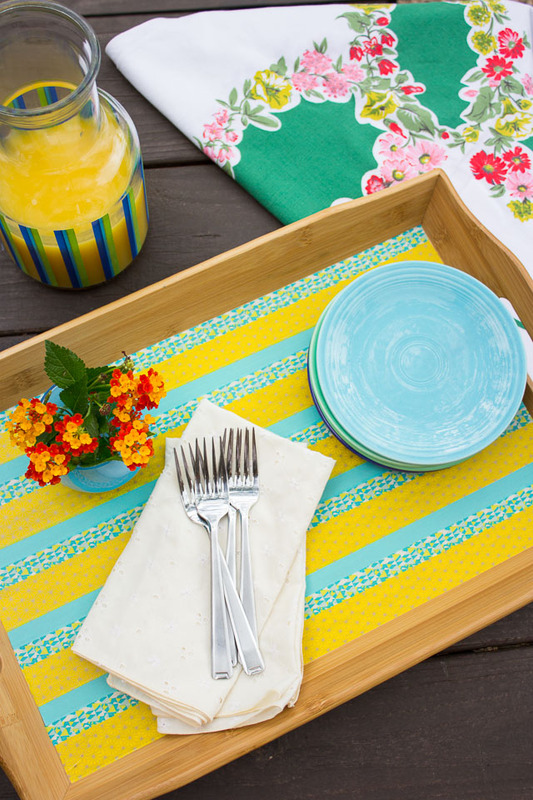 Serving trays – a must for eating outdoors. They will save you so many trips back and forth. I have a whole collection of these. As with vintage tablecloths you can just never have too many (and you can find lots of great vintage trays at thrift stores too)! I recently dressed up a plain wood tray with patterned washi tape and love how it turned out. 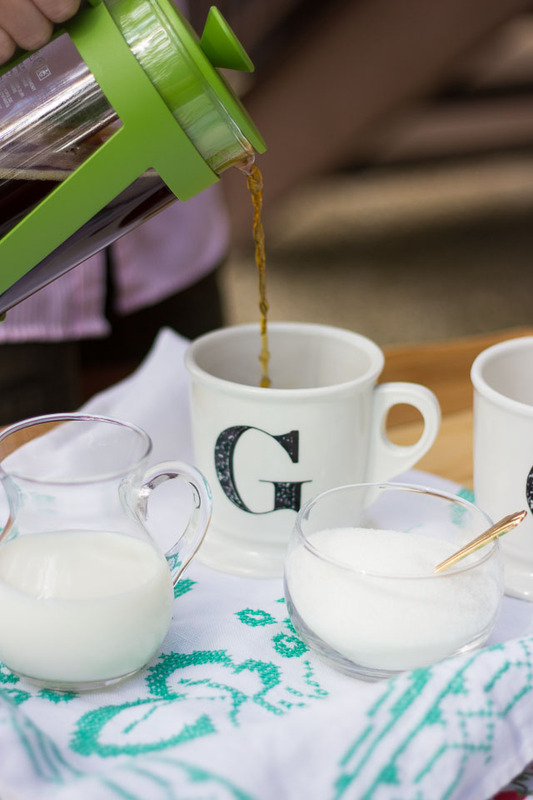 If you have an old tray at home this is a fun way to give it a makeover. I’ll be sharing the tutorial later in the week – stay tuned! This post is a part of the Happy Homes Campaign with KSW Media. Thanks to Downy Wrinkle Releaser Plus for sponsoring this project and today’s conversation. All content and opinions as always, are my own. 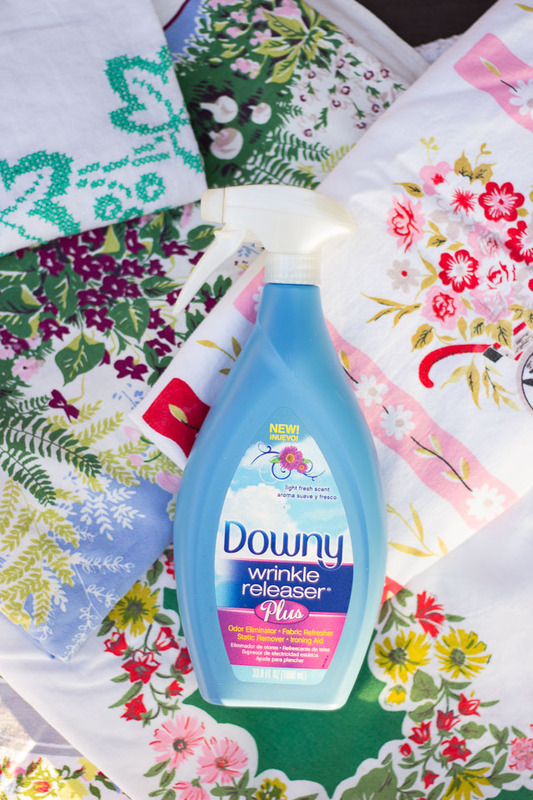 If you would like to try Downy Wrinkle Releaser Plus, you can download a coupon here!